Loving mother of Teresa (Andrzej) Zdanowicz, the late Janusz Dlugosz and Halina (Marek) Czech. Dear grandmother of Bridget, Renee, Diane, Michael and Nicole. 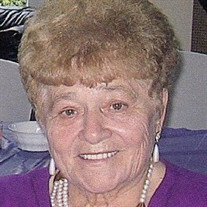 The family of Jozefa Zofia Dolecki created this Life Tributes page to make it easy to share your memories. Send flowers to the Dolecki's family.